I promote traveling, even if that traveling is around your home city. 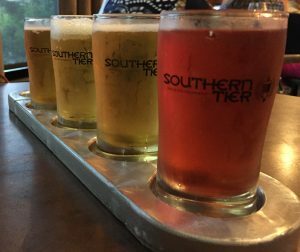 If you find yourself spending time on Chautauqua Lake, stop by Southern Tier Brewing Company. There at 2072 Stoneman Circle in Lakewood, NY, you and friends can enjoy the fare at their kitchen, The Empty Pint. I’ve been to Southern Tier Brewing Co. for their Summer Fest, which involves beer, music, and keg bowling. The brewery tour is impressive, and if you get there in good time to take a tour, the souvenir tasting glasses are a good size. But for this visit my husband and I were meeting friends at their lake house for the weekend and just needed dinner. Since The Empty Pint has opened since last we were here, we gave it a shot. Southern Tier is beautiful inside and out and the perfect location for a mid summer’s eve. The ordering process is simple: look at their menu and order your meal at the front counter. With order number in hand, move over to the bar to grab your beer or four (I mean a flight, obviously). Finally, get settled at one of the inside or outside tables. Both the indoor tavern room and outdoor patio have incredible ambience and you can’t go wrong either way. I am pleasantly surprised with the vegetarian options available on The Empty Pint’s menu. The Veggie Joe Specialty Sandwich caught my attention, as did the Starter Veggie Beautiful Mess. Black bean and sweet potato? Yes, please. But instead of either, I decided on the Tacos with Veggies and I still got the black beans and sweet potatoes I wanted. Who doesn’t love that combination? My husband and I also split a flight of beers and everything was great. How can a beer from Southern Tier not be great? Some where just not as great as others, and he and I have our differing opinion on those, but by the end of the night there was nothing left. Those Tacos with Veggies are amazing! I rave about a lot of food on this blog, but I am really happy with this food. It’s probably for the best I don’t live in Lakeview because I would drop $12 on these tacos about once a week. They’re incredibly tasty, particularly for vegetarian fare. The black bean and sweet potato blend has a bit of tang and the lime aioli, cotija cheese, and pico de gallo are all beautifully fresh. The flour tortillas may or may not be vegan like Lloyd’s tacos, but I’ll order this meal again. That is, if I didn’t want to try the Veggie Joe, which I do. The Empty Pint is a winner–without a doubt. 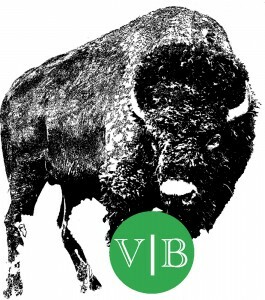 It’s tricky to find vegetarian food at tourist spots, and Southern Tier Brewing Company thought about their alternative eaters. While I can’t verify that the meals can be vegan, there are certainly gluten free, pescatarian, and vegetarian options available. It’s a lot easier to plan day or weekends out with friends when you know with certainty you can eat at places. If you’re looking for a good time, Southern Tier Brewing Company is still one of my favorite destinations based on their outdoor patio and small events alone. 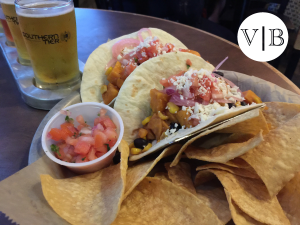 Now with these dining options at The Empty Pint, vegetarians don’t have to think about running to Tops to grab something vegetarian after the fun.